A terror-in-the-air action film, Non-Stop draws upon the jitters created on September 11, 2001 to create a potent but flawed mix of in-flight hijacking and murder with psychological overtones. Air Marshall William Marks (Liam Neeson) is suffering from the aftermath of a personal tragedy, and is emotionally all but down and out. Drinking heavily, smoking and barely able to focus, he starts his latest assignment on a seemingly routine flight from New York to London. He makes small talk with passenger Jen (Julianne Moore) in the seat next to him. 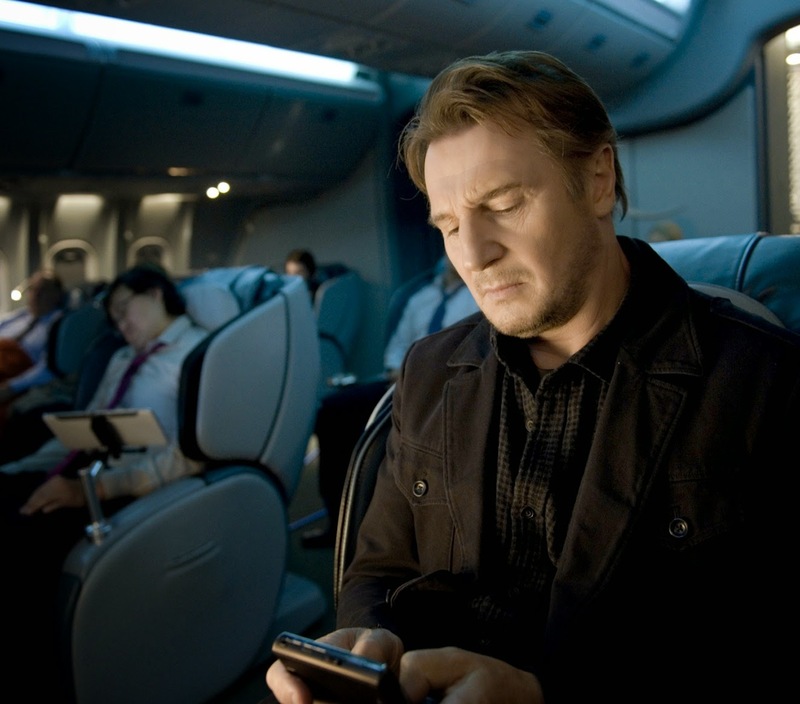 Mid-flight, Marks snaps to attention when he starts receiving unauthorized text messages. The sender claims to be on the plane, and threatens to kill one person on the flight every 20 minutes unless $150 million is deposited into a specified bank account. When the threats incredibly start to come true, Marks finds himself identified as a hijacking suspect, with a plane load of trouble and no one to trust. A French-American co-production, Non-Stop is a tense, single-set thrill-ride, with an innovative premise and deft execution, but the mounting tension and threat levels were always likely to be better than the details and the resolution. Not unexpectedly, the plot does suffer from plenty of logic gaps, while the rushed climax and awkward denouement cannot live up to the expectations generated by the cranked dial of lethal drama. Within the limitations of the adrenaline-fuelled action genre, Non-Stop does many things well. Director Jaume Collet-Serra packs plenty of visual panache into his carry-on baggage and unleashes it within the tight confines of the plane. The floating text messages are an excellent touch, and Collet-Serra expertly conveys the sense of claustrophobic confinement and confusion with one demented murderer hidden among 150 passengers 30,000 feet above the Atlantic ocean. Among the performers, Liam Neeson carries the film on his shoulders, and is given plenty to work with. Marks embarks on the flight way behind the starting line in terms of mental readiness, and Neeson allows all of Marks' psychological flaws to ooze out as the Marshall first doubts himself and then find everybody doubting him. Julianne Moore's role seems to have been only half thought out, while Michelle Dockery and Lupita Nyong'o play the two flight attendants trying to maintain sanity as the flight lurches from one crisis to the next. Some of the passengers are coloured in just enough to become interesting, Corey Stoll as a New York cop and Omar Metwally as a Muslim doctor among the more prominent. When all is explained and the final act starts, the film hits its patch of turbulence. Too many of the conspiracy elements twist in the winds of good fortune, and the climactic struggle to save the passengers alternates between moldy 1970s disaster movie heroics and too-obvious character wrap-ups. Non-Stop is a smooth flight somewhat ruined by a rough landing.